The current limiting fuse (center bolt to center bolt terminals) can be used at the transformers exit , by the low tension side (M�ximum 600 V.A.C.) over each one of the conductors used as feeders to the distributin panel in combination with the low tension breakers. 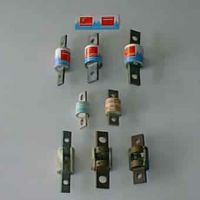 The current limiting fuses are manufactured in a conductor range from 2 AWG to 750 M.C.M., at each extreme of the conductor, as to insulate the system in case of failure.